Certain race mornings are absolutely surreal... and this year's Boston Marathon was absolutely one of those. After an amazing weekend leading up to Marathon Monday, where I was honored to receive the 2017 Spirit Award for Tedy's Team, run the BAA 5k with Katie and Tina and see friends/family from far and wide, I kept pinching myself on race day to see if it was truly real. 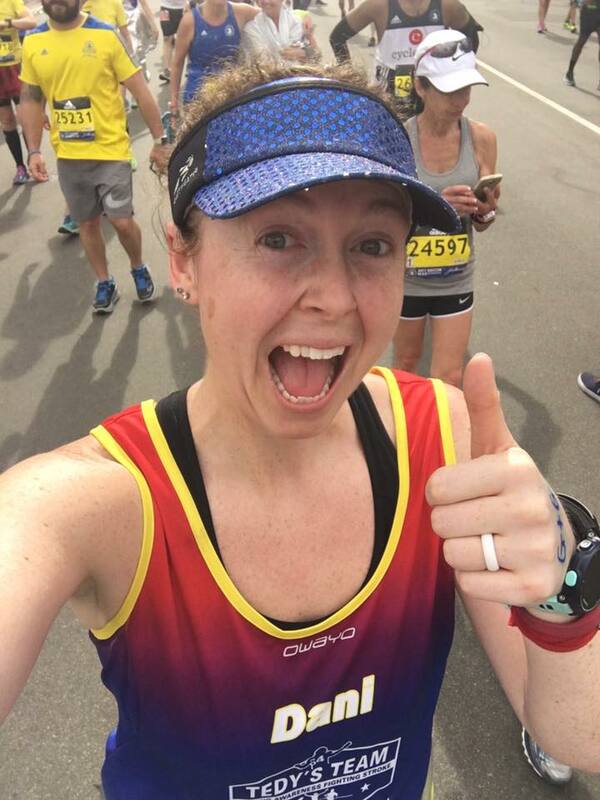 Was I actually toeing the line for my 12th marathon and my 4th Boston Marathon with Tedy's Team? Now my start time for the marathon was about 11:20am, but I had to be at Boston Common to meet the Tedy's Team bus to head to Hopkinton by 5:30am!!! Now I could've taken the later bus, arrived at Athlete's Village then walked to the house Tedy's Team hangs out at before the marathon... but I am a worrier and all of that sounded like a recipe for an anxiety attack. Taking the team bus - despite being before the sun was up - would be the safer bet. So I woke up at 4am and was at Dunkin' Donuts before 5am! :P The woman behind the counter asked: "are you running today?" I was too tired to come back with a witty response. Instead she got a simple: "yes!" I wonder if it was my outfit that gave it away? Armed with coffee and a bagel, the wife drove me to Boston Common to meet the team bus. Super easy and traffic free. :) It was crazy to think the next time I would see her would be about 8 or so hours later at Mile 26 of the race. Now I said the team had a house before the race, I left out the fact that it is a funeral home. The owners are an amazing family who open their real house (attached to the funeral home) and the funeral home to our team before the race. They have their own relationship to Stroke and the American Heart Association. It is amazing having a place outside of the elements before the race, especially in 2015 when it was 40s and raining. Our coach John Furey brought in 3 PTs from Joint Ventures to help with taping and stretching, a bunch of foam rollers/sticks and plenty of snacks. That is the one issue of being in the race area 5 hours before we start: boredom eating. :P Luckily catching up with teammates and sharing stories with new friends helps past the time... plus team pics! With pics completed and the qualified runners out on the course already, it was time to put the finishing touches on my race outfit. I add: G+G on my hand (in honor of my Stroke Heroes: Gramma and Grampa) and DANI on both of my arms (for extra cheers of course). Nothing else to do to prep, but get the show on the road... but first a team pep talk by fellow teammate Nate. After a quick cheer, it was time to make our way to the corral. Since we don't come from Athlete's Village, we have a side entrance to the walk to the corrals. With a swipe of the security wands as you enter. 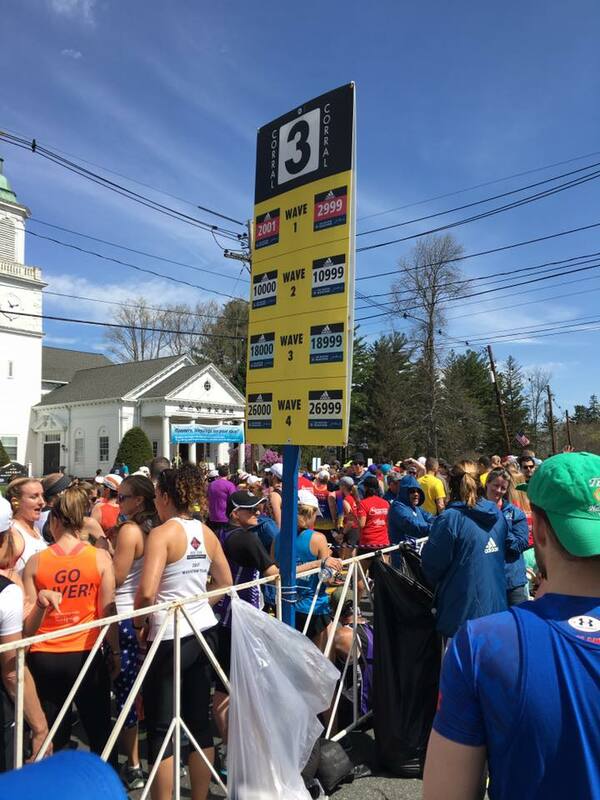 I still felt like it was a dream and I wasn't really about to take the 26.2 mile journey back to Boylston St.
After wriggling our way through the crowds, we made it to Corral 3. Okay I am in the corral, it has to feel real now... right? Well still living in a surreal space. If you aren't pumped for the race (and I am not sure how you couldn't be), seeing this historic sign will get your energy levels skyrocketing. It's also exhilarating being the same corral as hundreds of other charity runners. Thinking about the amount of money raised and the lives being changed by what all of these folks were about to embark on. Pretty sweet to be a part of that. The announcer started their remarks and I was shocked when I heard my name listed off as part of Tedy's Team! Can you tell I didn't expect it? And with that, we hit the Start Line, the Garmin started and the journey of a lifetime was beginning. Mantra for the day: Live in the mile you are in! There are over 35,000 people that participate in the Boston Marathon, yet without fail I run into people I know. This time within the first mile! OOhhhh that got me even more pumped for who else I might be able to spot along the way. Oh Elvis. Not a personal friend, but I'll take it. Since it was expected to be pretty steamy during the race and I wasn't really in the mindset to run solo, I let Amy/Nate set the pace and plan. They set out to run a mile and walk a minute - hoping to line it up to water stops if possible. I felt like the first mile went by in a blur. Well just 25 to go. Haha. The crowds were BRINGING it on this day just as I expected. The weather - while warm for the runners was perfect for the spectators. Oh and there was Jessica. Hey girl! Rockin' that Dana Farber singlet. And some spectators like to play with the hearts of the runners. Oh Brookline already? JK! We had 5 more cities to travel to before we hit Brookline. Love looking out in front of me and seeing streets full of runners and cheerleaders. Oh stranger thanks for that reminder!!!! 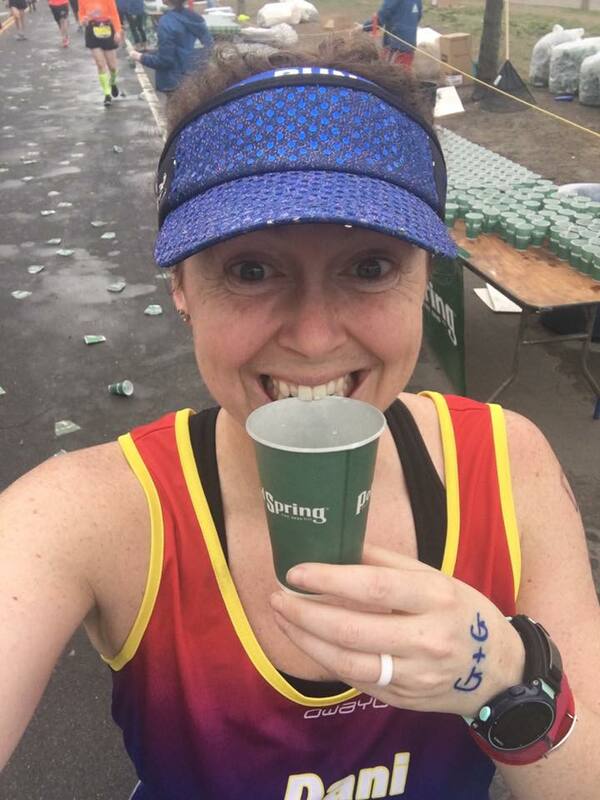 #iRunForBeer I was thinking I might be enjoying some before then if offered any, which I knew I would be. And look who I spotted out on the course... The Doug Flutie. I should've sped up and selfied with him, but I couldn't get a clear path to him quick enough. I think it was around this time that I said to Amy/Nate that I still couldn't believe we were here. It was race day and we were a part of the THE Boston Marathon. A true true honor. All morning and really the days leading up to the marathon, I worried about my IT band/knee pain. It had been flaring up and as a result, I had only been running about once a week. The goal was to make it through the marathon and work with my PT to fix the issue. Thankfully I was so into talking with Amy and Nate and soaking in the surroundings that I didn't even think about what was going on in that region of my body, which was welcomed. Throughout the race, you will find inspiration each and every step of the way, especially when you see the men and women reppin' the 70+ age groups. I hope I am healthy enough to run a marathon at that age. While the Tedy's Team singlets aren't the most appealing things to the eye, they are SUPER easy to spot while out on the course. Hiii Larissa! And we will all remember 2013. 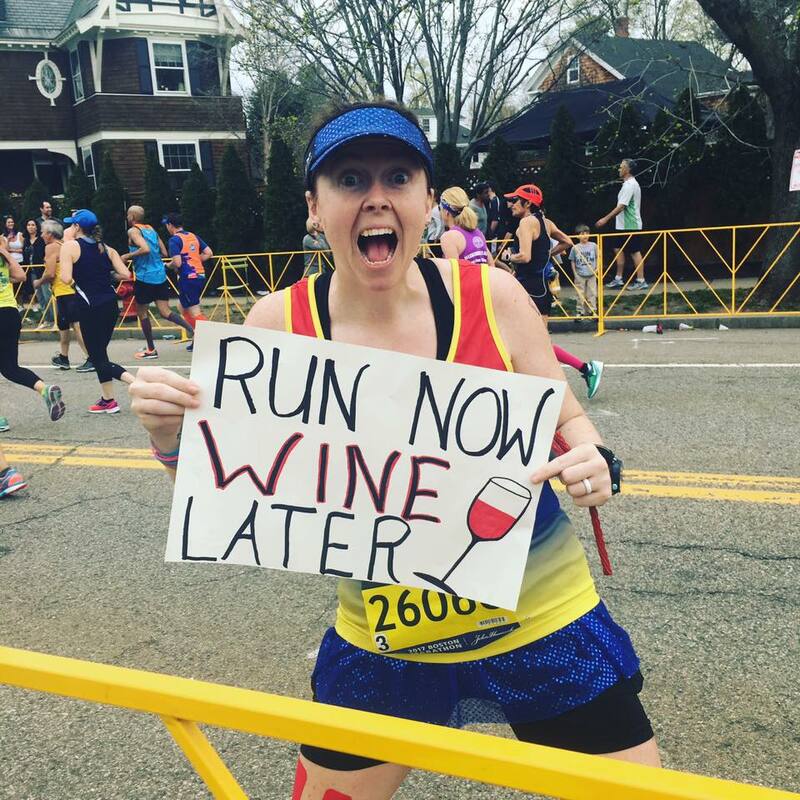 I really appreciate having friends that will indulge in my ask for pics during races. I just love documenting all of the smiles and feelings from these special days. Will do random stranger. Will do. During a race, I do the best I can to not stop for a port-o-potty break but when the feeling hits the feeling hits. Luckily Nate had to stop at the same time so we were able to waiti n line together. At this point, Amy was feeling good so she kept running and our plan was to catch up with her. Unfortunately that never happened. But whenever running with a group you have to have that pact that if someone is feeling good they take advantage and ride it out. The quick break was worth it and it came right before the amazing Mile 6 fun through Framingham. This is a fun part of the course because this is where our 21-mile training run starts so from here on out we know this course and what to expect. My favorite water stop of the entire race would be the Mile 8 water stop. Why? Because my friends from the Slumbrew Happy Soles were manning it. I got to see and hug a bunch of folks I love dearly. City 4 is up: Natick! It was just around this time that the knee started getting cranky. I tried to focus my energy on the surroundings rather than the pain. It just stinks that miles 9-11 are the least exciting miles on the course. Luckily we knew the Wellesley girls would be coming up arounds Mile 12. And just like that we were halfway through this crazy adventure. I was wicked thankful to see Larissa's family at the halfway mark. Those smiling faces picked me up as my knee pain started to increase. As tears started welling up in my eyes over the sharp knee pain stemming from my IT Band, I spotted my crew!!! Dan, Page Jenn and Allie were just before Mile 14. .. complete with smiles, hugs, words of encouragement and champagne! These people were exactly what I needed in that moment. Thank you Tedy's Team for bringing them into my life. Plus that hit of champagne hit the spot. 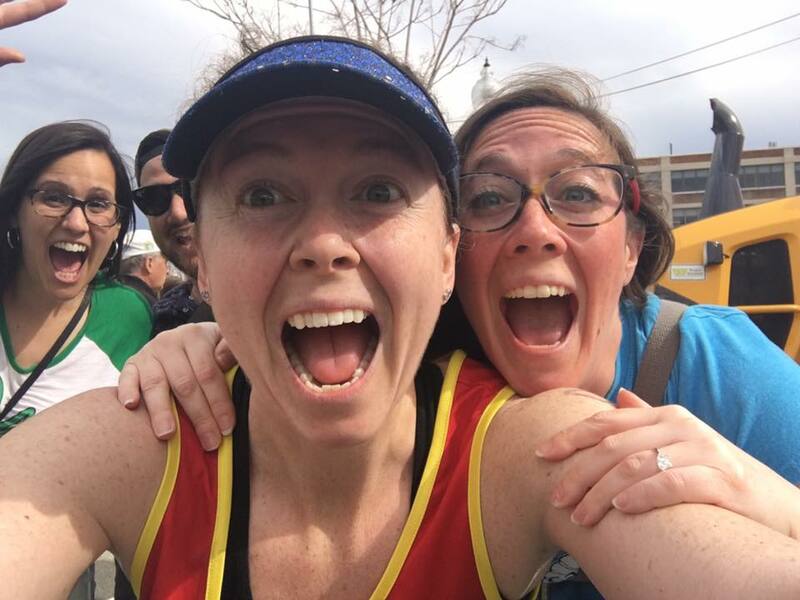 I gave them each another hug and couldn't wait to see them again at the Finish. With the knee pain increasing, I popped into the next med tent, but they don't have meds at the meds tents. Oof! I was now on the hunt for some ibuprofen or something to try and dull the pain. Just as I wanted to start crying again, I spotted my friend Bill. Time to distract from the pain with another selfie. Seeing Margaret, getting a hug rom her, some additional meds and words of encouragement was again what I needed. She is always in the right spot during a race when I need her. Right around this time the skies started the cloud up a little, which was appreciated. It was 80 at times on the course and any sort of cloud would help. This is another reason why I am glad I stuck with Nate and Amy from the beginning and didn't try to push the pace in that weather. I saw a lot of folks in med tents and hurting along the way. Now the meds weren't kicking in fast enough so at Mile 17.5 I bid Nate adieu. He was feeling good and I didn't wan to hold him back. Honestly I wouldn't have gotten as far as I did without him. 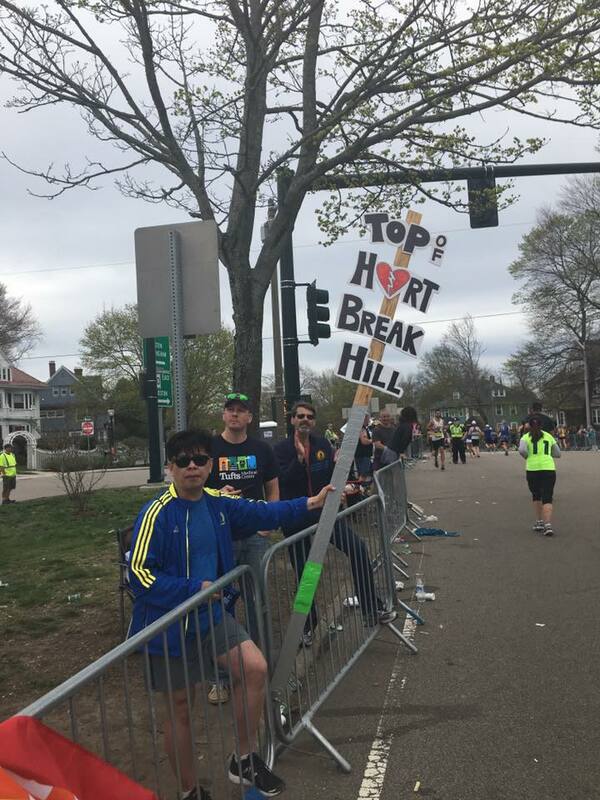 Focusing on the crowd and keeping in his run/walk break pattern allowed me to push past the pain. It was time to let him go and walk for a spell. As we passed the historic Newton Fire House, we each attempted to run. We wished each other well and I said I will see you again on this Hill. I started up the first hill of the 3-mile stretch of Heartbreak and the meds must've kicked in because the knee pain started the fade and I started picking the pace back up. While on Heartbreak, I noticed a sign for one of my cousin's friends. I had to do a double check before I realized I knew the people behind the sign! I ran past them then had to double back for a pic. Haha. I was able to see my tri team mates from ZOOM, our coach John and even Big Bird. Of course I was soaking in the entire run because who knows if I will ever run Boston again, but especially these last 5 miles. So for now I was relishing in the flat. At this point, I wasn't sure if I would finish in under 5 hours or not. I would like to, but I wasn't about to miss a pic opportunity in the last few miles for it. Right after having this discussion in my head, I spotted a group with not 1, but 2 signs just for me! I might've let out a huge squeal when I saw the sign on the left then they told me to turn it around and that was on the back!! I looked to the right of this group and there was my friend Jamie. Who was quickly followed up by my friend Stacey! And with that there were only 2.2 miles left in the fun! This race had high of highs and low of lows. Something that helped keep me pushing forward was having each mile dedicated to a Stroke Hero (of mine or a friend's). Having each mile in honor of someone who had suffered a Stroke allowed me to dig deep and channel their strength and courage. I knew the last two miles would be a freakin' party and filled with friends... and it didn't disappoint. I could see Mount Kenmore in my sight and at the top, the famous CITGO sign. I love that freakin' sight. As I crested the top of that incline, I spotted 4 friends in a row. What a way to be welcomed at the top! And it was time to get my pic with the Mile 25 marker. Just 1.2 miles to go. Now it was time to run through Kenmore. This is something you can't even explain. THe streets are packed on both sides with spectators and folks that just got out of the Red Sox game that are stopping by to cheer on the runners as well. The intensity picks you up as you approach this awesome sign. And there they were. I waited all day to see these faces, plus my friend Kelly who had come in for the weekend from NY. I hugged them all and took the famous right on to Hereford, where I was surprised by my friend Julie. I ran past her, had to backtrack, get a hug and of course snap a selfie. It was time to get emotional as I took the left on to Boylston. THis is an emotional stretch for many reasons, but thoughts of 2013 came flooding back as I ran towards the Finish. I allowed those feelings to happen and move on to the present. After a quick wave to our Team photog in the window of the Lenox hotel, the Finish Line was there and marathon #12 was done. There were not 1, but 11 volunteers I knew handing out medals so I made my way to see them. Thanks Jeff for being the official person to hang that magical unicorn around my neck. I still can't believe I completed Marathon #12 and Boston #4. Ahhhh... what a magical experience as always. Now I was ready to make my way to the Lenox, see my family, get a massage, eat some pizza and take a shower!! Oh and have a beer! I swear that was happiness on my face! Plus you get to celebrate each other's accomplishments together. Special thanks go to the wife as she put up with hours of training, freakouts over what to wear for a training run/injuries/fear/etc, and loving me each step of the way. If I never run Boston again, I will be okay with that as I have had the pleasure of running it for 4 years and raising $36,000 for Tedy's Team. But if I can run it again, I will jump on the chance.